With the end of the Civil War, times seemed propitious for North Carolina finally to attain the diversified economy it had so long expected and sought. The end of slavery would, in theory, create a strong domestic market for manufactured goods, and the weakening of the planter class would allow less emphasis on agriculture. But there were massive obstacles. Factories and shops that survived the war were often worn out from constant activity and a lack of replacement parts. A domestic market would be many decades away, as the collapse of the price of cotton after about 1874 impoverished both white and black farmers. Capital, always in short supply, was even harder to come by after the war. Most North Carolinians' savings and investments had been in Confederate currency, made worthless by the Reconstruction acts and the Fourteenth Amendment. Almost every bank in North Carolina was bankrupt as a result of the war. After the passage of the federal National Banking Acts in 1863 and 1864 and the move toward a gold standard, the entire nation suffered from deflation until at least 1900. Most cash was concentrated in northeastern cities, and would-be entrepreneurs in North Carolina often had to seek capital there, ceding at least partial ownership and control to northern lenders. By about 1880, however, it was obvious that any gains in manufacturing would have to revolve around the resources that North Carolina possessed; namely, agricultural and forest products and cheap labor. By the late 1870s, tobacco processing was a major industry in Durham, Winston-Salem, and Reidsville, with the Bull Durham factory in Durham being the largest producer of smoking tobacco in the United States. Indeed, until it was dissolved by an antitrust suit in 1911, James B. Duke's American Tobacco Company controlled 80 percent of the U.S. market. Lumbering operations and sawmills increased in importance in the state, especially in the Sandhills region, as lumber railways were built to open more pine forests to exploitation. North Carolina's furniture industry also began to expand during this period. Based primarily in High Point, Thomasville, Lexington, Hickory, Salisbury, and Statesville, the industry first provided unfinished hardwood to northern factories and wooden spindles, bobbins, and shuttles to local textile mills, but it soon established a reputation for its finished furniture as well. Related industries producing veneer, plywood, and varnish grew as they provided materials to the furniture manufacturers. Textile production received a great deal of investor attention for several reasons. From an economic standpoint, industrial revolutions, whether in Britain, the northern United States, or North Carolina, almost always began with textiles. It was a labor-intensive industry in which low-wage, inexperienced, unskilled workers (including women and children) could serve as a major resource. From the standpoint of the state's cotton planter or merchant facing the decline of his current business, textiles provided a new but related outlet with a positive potential. To local communities dependent on the failing cotton trade, it promised economic salvation in the form of work for bankrupted or failing farmers or their families, business for local retail establishments, increased property values, and economic growth. Surviving antebellum mills carried on, and experienced mill owners rebuilt or modernized their mills. 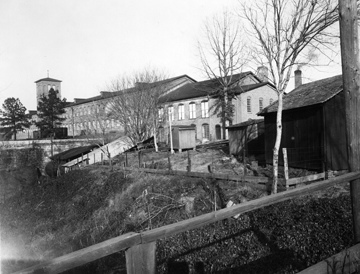 But many more new mills were established, especially under the precepts advanced by Daniel Augustus Tompkins. Tompkins, who settled in the Charlotte area in 1883, owned his own foundry and design firm and also represented several northern manufacturers of textile machinery. He helped local communities organize grassroots drives to "bring the cotton mill to the cotton fields" through newspaper and publicity campaigns. Local economic leaders would pledge what they could to capitalize a factory, but the less wealthy were also urged to contribute as much as they could afford, subscribing to stock in monthly installments. In this way, many local factories were established in the "cotton mill campaign" of the 1880s. In 1877 there had been fewer than 40 mills in North Carolina, most survivors of the Civil War. By 1884 75 mills existed. Two decades later, there were estimated to be 318 factories capitalized at $3.9 million, operating more than 67,000 looms and providing employment to 51,000 North Carolinians, many of them women and children. Roberdel Manufacturing Company Mill #1, c.1910, Rockingham, NC. From Carolina Power and Light (CP&L) Photograph Collection (Ph.C.68), North Carolina State Archives, call #: PhC68_1_345. Available from http://www.flickr.com/photos/north-carolina-state-archives/2344643875/ (accessed October 2, 2012). Thank you for your question. Jennings Furniture was in business at least as early as 1899.